Thewinecomposer.com has been pretty quiet over the past months. However, this was not a sterile silence. We have developed meanwhile in three interesting direction, that will bring some new dimensions in the project as soon a Spring 2017. The first thing I am going to tell you about, is our project to develop by using Austrian wines as an inspiration. To begin the work, we have attended what is arguably the best wine fair in Europe, VieVinum. This is a biannual fair, designed for the professional as well as the wine lovers. It was the perfect place to start our research. Thanks to the dynamic promotional policy of Austrian Wine Marketing Board, we have been able to attend many event and many tastings within the fair. One of the strengths of this event is to open different tasting spaces and atmospheres. On the first evening, the tasting was hold at a Heuriger. Table after table, you were able to discover every wine region and a few hundred of wines. Around the tasting you could eat the traditional Heuriger food and be entertained by a folk trio. An ideal way to break the ice, so to speak. Unformal and yet very close to the essence of wine: food, culture, good company and good moment. The next day was the vertical tasting day. This event was a seated tasting were you could order flights of wines to taste and compare, over almost thirty years. The organisation was flawless and I rarely had the opportunity to taste the wines in such a perfect situation. Then started the fair itself. Three days of intense tasting and discussion. 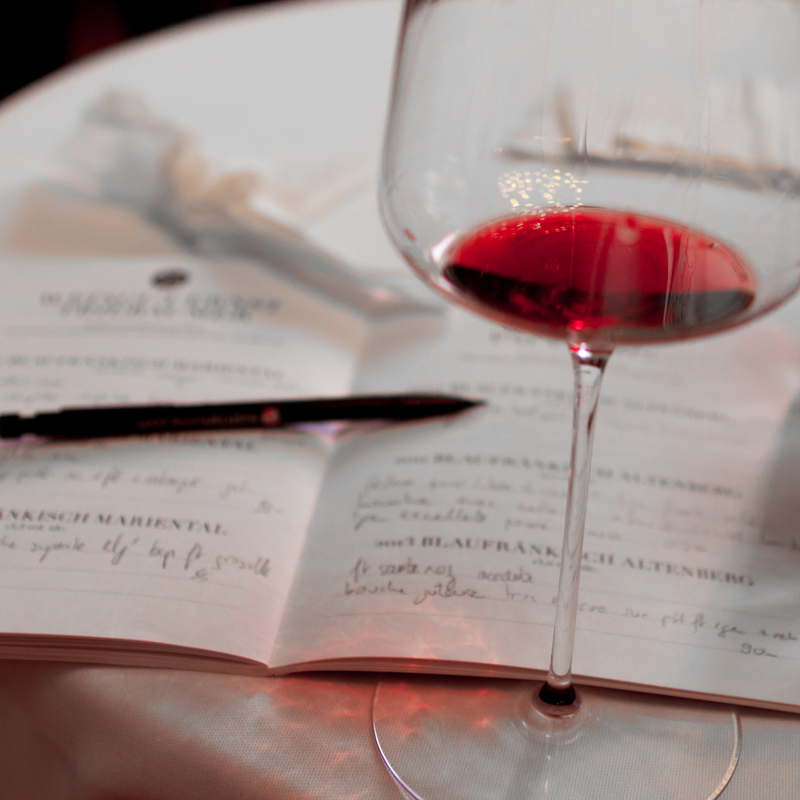 Many side events were programmed, such as an exceptional Blaufränkisch thematic tasting. The other great thing about VieVinum is that, besides being able to taste virtually anything you want from Austria, you can also discover German, Slovenian, Hungarian or Italian wine… so it is a very versatile event, with many openings for the palate and the mind. Some kind of polyphonic tasting. In the middle of these hectic days was organised the Big wine Party, yet an other event, with music and cocktail, were you could entertain a bit more loudly than on the first day. I can tell you that we were already pretty tired at that point. So that we did not stay long enough to get the prize of Tuomas, who won the tasting competition! These were a few but very intense days. We have opened our Austrian wine chapter with it and came back with a lot of ideas, material and inspiration. Overall, this translated into the tasting of around 400 different wines, from 1999 to 2015. Is there a better way to get a good general image of a wine region? I will finish with a few key facts. Austria produces mostly white wines but red have been developing quickly (since the mid-80’s), especially in Burgenland and Carnuntum. The total surface planted reaches around 45 000 ha. In comparison, Burgundy represent 30 000 ha. Austria is therefore a rather small country in terms of surface. Average quality is however very high, arguably one of the highest in Europe.